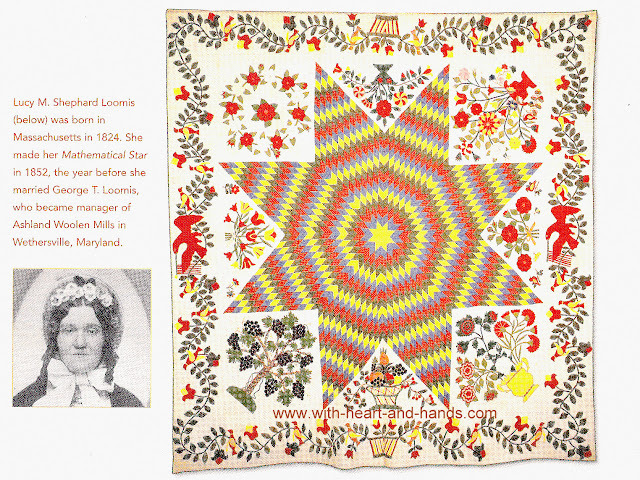 Lucy M. Shepherd Loomis, who was born in 1824 in Massachusetts, became a very accomplished quilter. She made this spectacular quilt which she named "Mathematical Star' when she was just 27 years old. 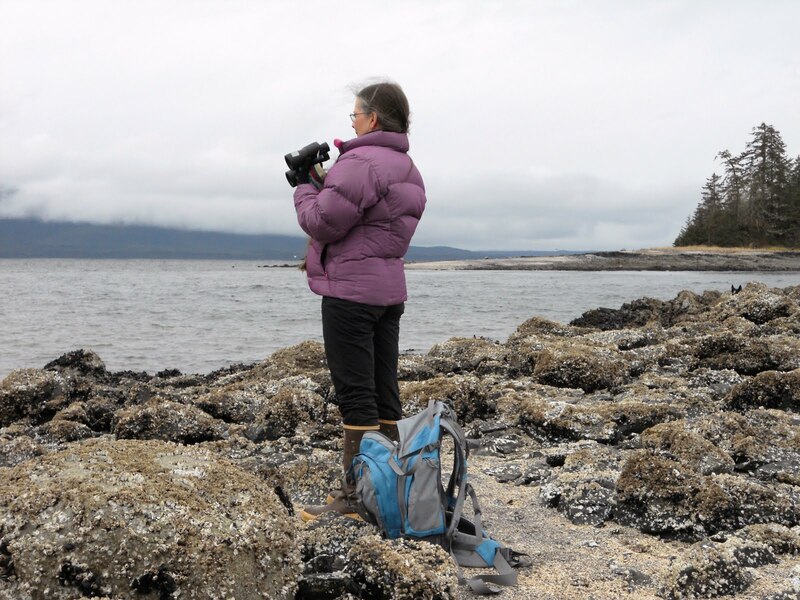 Lucy's quilt follows the traditions of the time by incorporating scraps of fabric from her trosseau in two of the blocks and chose a challenging pattern known as Blazing Star, Bethlehem Star, or Lone Star. But Lucy choose to name her version the Mathematical Star. As you can see she placed her yellow fabrics for most impact with rings of yellow diamonds in the pieced star where they almost seem to vibrate with energy. Her reds and yellow tulips are tied with a pink bow. Red symbolized love, but also joy festivity and passion. Yellow was for faith, goodness, intellect, and intuition. Motherhood was then represented by the pink bow and meant to not only bring together but to join all of these elements as one. The three roses all symbolize birth, life, and death, and stand for the Holy Trinity...Father, Son, and Holy Spirit. If you look at the butterflies and birds ..they are all on branches. Butterflies represented our souls and immortality, while birds manifest as transcendence or rising above our mundane lives to an eternal and immortal one. And then, of course, there is the pineapple and the grapes and other fruits of the harvest. Pineapples signify hospitality and when combined with grapes, which represent wisdom and sacrifice, creates a blend of fruit representing fertility. Her workmanship is considered almost perfection and she combines the traditional Baltimore album style with individual applique' blocks. 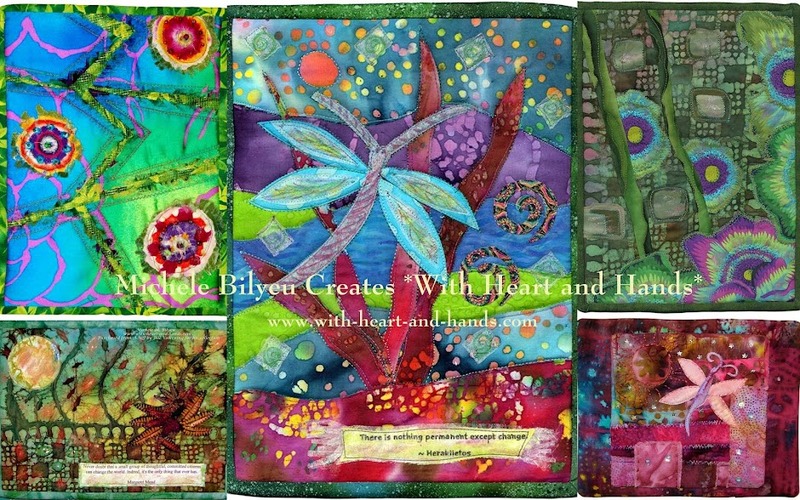 She uses applique', reverse applique', stuffed work, buttonhole stitching, and embroidery. As Lucy made this quilt a year before she married, it would appear that she was creating her own version of her own wedding quilt......one filled with all of the good omens, hopes, dreams, and wishes that she wanted to bear fruit in her marriage to George T. Loomis, the following year. And these same wishes are mine for all of you this holy Christmas season and the beginning of a new year and new challenges, transitions, and changes. I wish you love, faith, goodness, intellect, and intuition, passion, energy, and fertility required to grow in your own creative endeavors and in your own lives from this time, through transcendence and into immortality. 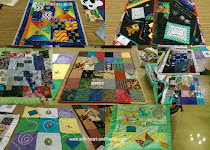 And may be all leave behind at least one really special quilt that will outlive us in the memories of all who follow us! Merry Christmas, Happy Holidays, and thank you Lucy for you mathematical and blazing lone star of Bethlehem! It is indeed an amazing piece of work. I want to thank you for introducing me to the work of Mary Lou Weidman during the year - I received one of her books for Christmas and I can hardly put it down. May God bless you and your family at the "most wonderful time of hte eyar". Wishing you many joys on this special Christmas day. Thank you for the gifts you freely share with all on the net. I enjoy visiting your blog many times and really liked this most recently posted interpretation of Lucy's Mathematical Star Quilt as well. Have a very Happy Birthday my friend! I'm sending wishes for all those things you listed at the end, and more, back to you also. Hugs! I love having all the symbolism explained. Thank you for the kind blessings. I thought I was over the need for fertility, but in this case I will gladly accept! All the best to you my friend! Amazing! The hours that went into this beautiful quilt.... Can you imagine her planning and sewing and quilting? Hope you and your family had a wonderful Christmas, Michele. This really is exceptional. It means even more to someone like me who is math challenged. Truly a work of art. Justlike you. Thanks for all the encouragement this past year. Your kind words and lovely messages meant more than you can imagine. The best gift of all. Michele, están preciosos todos los trabajos!!! hello. I have my blog ready for people to join now. Please come and sign in thank you for the support.